Caledon Produce Farms Ltd. is a third party certified produce company. Certification is the term used to describe the determination by a qualified authority that we meet the standards and that our food safety program is being maintained on an ongoing basis. This involves having a third party auditor from the Certification Body visit our operation, review the food safety manual(s) and related records, interview our operator and staff, and assess our company’s conformance to the CanadaGAP Audit Checklist. Certification indicates that our operation has a system of procedures to minimize the risk of contamination to product. The auditor gathers evidence to attest to the ongoing maintenance of our food safety system, rather than simply gaining a snapshot at a given point in time. 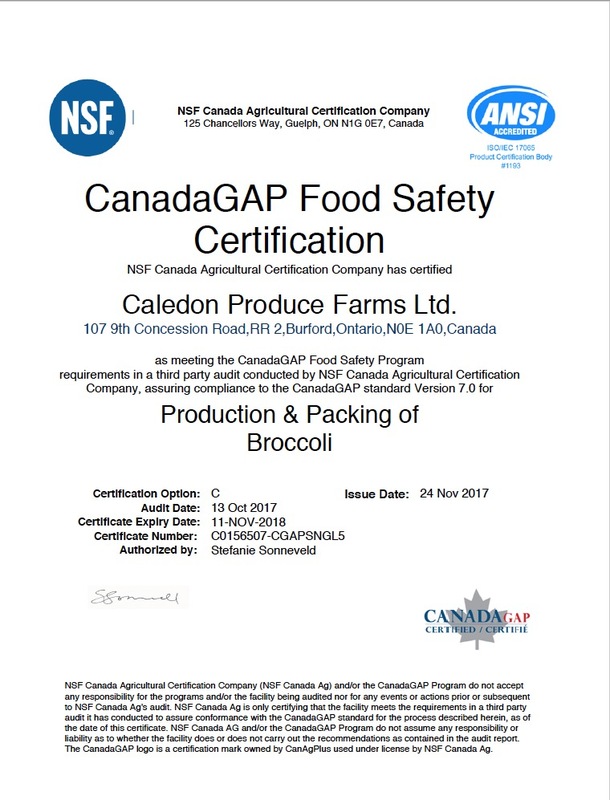 At Caledon Produce we pride ourselves on our dedication to food safety and have been third party certified for 10 consecutive years.